Afwaj e Pakistan History book authored by Muhammad Aslam Lodhi. Pakistan army is the best army because they are not scared from death. They join army because they want to martyred. And Pakistan army is a well trained in the world, very tough training. The present book is a historic documents which contains history of the struggles, great achievements and sacrifices of Pakistan Armed Forces is the last fiftyseven years. 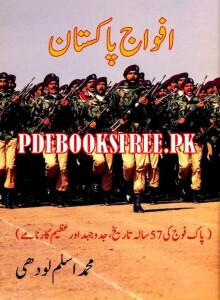 A comprehensive book provides complete history of Pakistan Army in Urdu language. This history book of Pakistan Army is now available to read online and download. Visit the following links to read online and free download History of Pakistan Army book in Pdf format for offline reading and references.